Don't over pay! We may not have an ocean view, but you can enjoy all Siesta Key has to offer just blocks from the beach at a great price. In just a short walk, you can enjoy amazing sunsets, watch for dolphin or just relax and unwind on the pristine white powdery sands of the world renown Cresent Beach. Our convenient location is walking distance from anything you need. Grocery Store, Drug Store, Convenience Store, Post Office, Night Life, restaurants and much more are all just blocks away. We invite you to come enjoy this bright 2BR/2BA condo. Recently updated and tastefully decorated, light-filled end unit with beautiful bamboo flooring, newly, updated and fully stocked kitchen. The master bedroom features a king sized pillow top bed with fine, soft linens and duel side tables, lamps, new carpet and a TV for your viewing enjoyment. The guest room offers 2 twin ultra comfy beds with a pull out trundle, new carpet and fine linens. Relax, read, or enjoy a cool beverage among the tree tops in the quiet and cozy lanai which has been recently tiled, painted and re-screened. We have everything you need to enjoy your beach vacation right down to beach toys, chairs and towels. 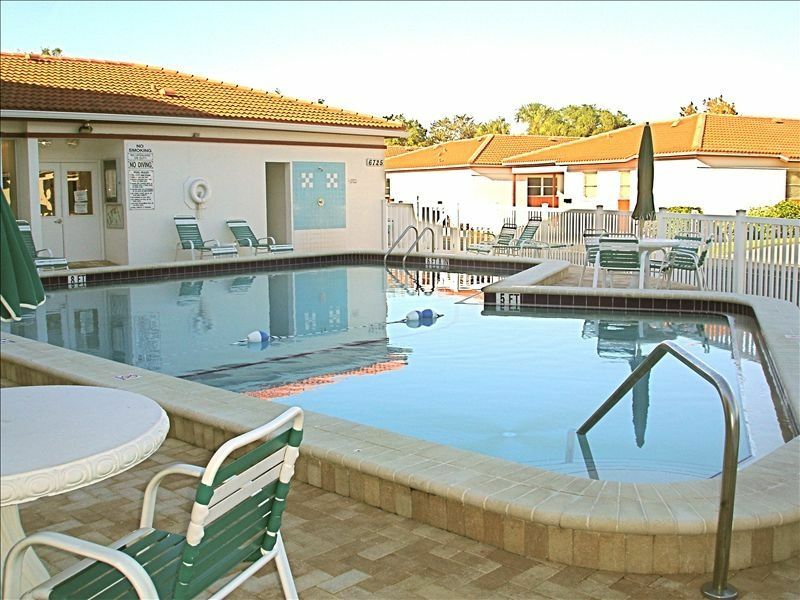 Our complex is clean and well maintained with beautiful grounds filled with lush greenery, nice clubhouse, recently updated pool. Convenient location just south of Stickney Point Bridge. Coin operated laundry is also conveniently located on the premises. Had a great say in Siesta Key. The condo was clean and comfortable. It is a great location. You can walk to stores and restaurants. The beach is a short walk across the street. Enjoyed the pool and the friendly people there. Using the free trolley to get around was great. Owner was very nice and responded to questions or concerns promptly! Well- maintained, functional, kitchen had all cooking essentials, convenient to everything. Vista Hermosa is a nice, quiet community in a nice, quiet location within easy walking distance to beautiful Crescent Beach, and to restaurants, the post office and shops. The condo we rented was clean, comfortable and well-appointed with supplies for kitchen, baths and beach. Jack was very responsive and easy to deal with. Everyone we met at Vista Hermosa was very friendly and helpful. We had a lovely vacation. Clean and well maintained. Owner was very responsive. We really enjoyed staying there. Close to the bridge, quiet location, quiet building and close to the beach by walk. Great place for running on that part of the island. I would sincerely recommend this condo. We enjoyed the place very much. Everything we needed for the stay was all here, beach chairs, umbrellas, stroller & etc. Thank you John we recommend this place. Contracts to be sent via email. Contact owner !